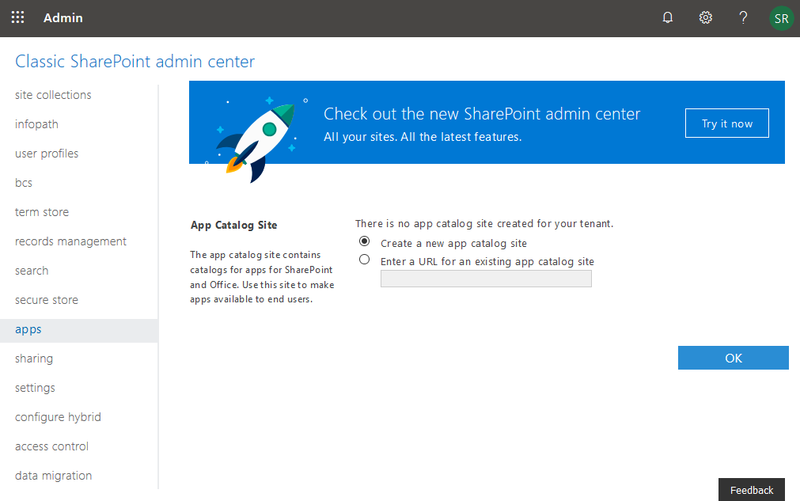 Home Apps PowerShell SharePoint Admin Center SharePoint Online How to Create App Catalog Site in SharePoint Online? 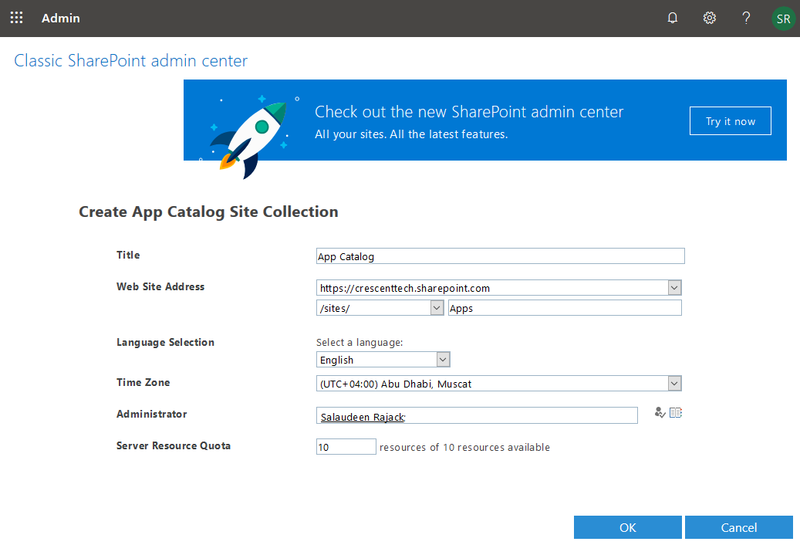 What is App Catalog in SharePoint Online? App Catalog in SharePoint is a central location where we can manage custom developed apps or 3rd party apps and make them available for users to download across all site collections. These apps are listed under "From Your Organization" link when you try to add a new app from Site Contents page of your SharePoint Online site. 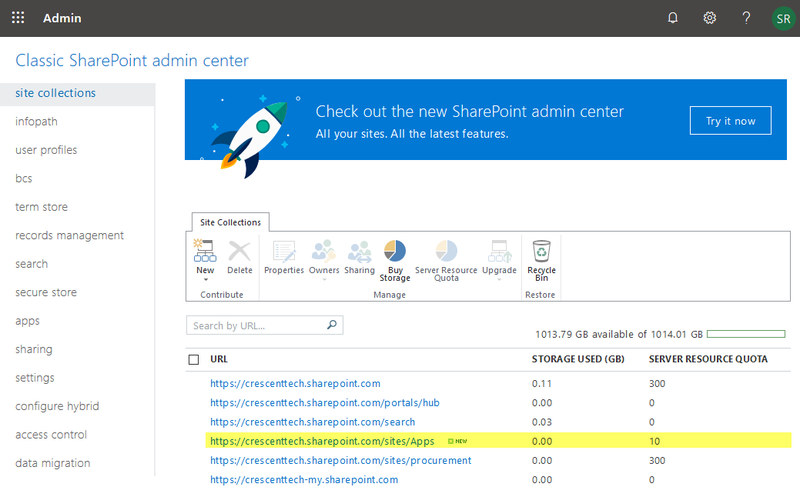 Click on "Apps" link from the left navigation of SharePoint admin center >> Click on "App Catalog" link in Apps page. The first time you select the App Catalog link, you are prompted to create a new app catalog site or use an existing site. This creates Tenant app catalog in SharePoint Online. Once the site gets created, it will be listed on the site collections list. Now if you go to Admin Center >> Apps >> App Catalog, You'll be redirected to the app catalog site which we have created! You can also setup Site Collection App Catalog instead of Tenant App Catalog, so that solutions are deployed only in the selected site collection. Also, this prevents other sites to have access to the solution during the development phase. Once the development is completed, you can deploy it to the Tenant App catalog to make it available to the organization. Now, you should see the "Apps for SharePoint" in Site Contents page.